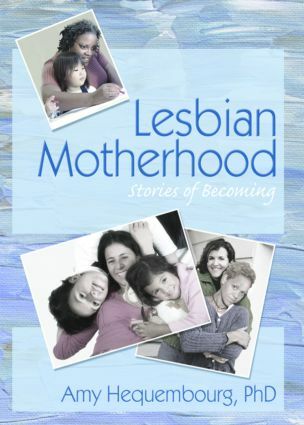 A unique practical application of poststructuralist theory to lesbian mothers’ narratives, Lesbian Motherhood: Stories of Becoming analyzes the personal stories of 40 lesbian mothers to discover the complex ways their sense of self is constructed in the current legal, political, and social climate. These intimate narratives are examined by using Gilles Deleuze and Felix Guattari’s conceptual framework to understand subjectivities by focusing on the many flexible lines of movement that constitute subjectivities, or ‘becomings.’ This unique source reveals deep insight into a lesbian's construction of self through her stories about her own sexuality, parenting, and other experiences in becoming a mother. Lesbian Motherhood: Stories of Becoming challenges the assimilation/resistance perspective typically expressed by scholars of lesbian motherhood. Qualitative interviews reveal startling new perspectives to lesbian mother subjectivities viewed within the context of the legal, political, and social areas that seek to define and regulate contemporary family life. This powerful source explores in detail the discursive strategies through which lesbian subjectivities are created and recreated. Deleuze and Guattari’s concept of ‘becoming’ provides a valuable framework for analyzing the discursive strategies employed by those participating in this study. Lesbian Motherhood: Stories of Becoming offers insightful, powerful information that is indispensable to GLBT scholars, and social theorists.